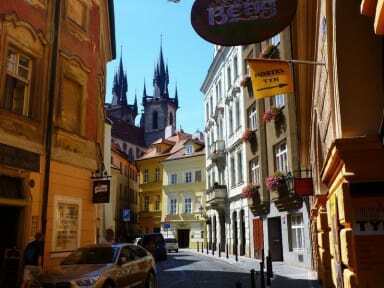 Hostel Prague Tyn is in an excellent location just off Old Town Square in the beautiful old quarter of central Prague, making it perfect for those looking to explore the city on foot. This new, clean hostel has a friendly, cosy atmosphere and friendly staff who are 'particularly helpful in telling us where was best to eat, drink, sightsee and even what to drink', according to one of our happy guests. We like that their breakfast includes a packed sandwich, making it ideal for those on a budget. I love it! The location is perfect and the staff was always so nice and helpful! They have everything you need, lockers, towels, breakfast... I loved to stay there and I really want to go again. My only complaint is noise related. The bathroom door on our floor slammed so loudly and it was ultimately inevitable to avoid. In addition, the windows did not block out noise from the area in front of the hostel so you could hear the entire conversations of people talking outside. Inside the hostel, the walls were pretty thin as well and people would leave the big door to our floor open so noise traveled fast from the stairwell. Besides that, the hostel is located in a great location! Superb location - just minutes walk from the Old Town Square. The staff was very helpful. Free breakfast was a very nice inclusion! The only constructive critiques I could give would be that the shower door that I used was broken which led a lot of water to get on the floor. Also, the reception desk is in a very narrow hallway which is not ideal if you are attempting to check in right after a large group. However, they have a very secure luggage cage in a locked room. I would stay there again. The Rooms are good and clean. Staff is friendly . As the hostel is in Old City centre so almost full during Summer. Only The Toilet and Bathroom , she shared among 20 people on one floor . so you have wait for your turn .! Great location within Prague and AMAZING showers. However, I found that the social life aspect was very lacking as every time I went into the common spaces I was alone and the free breakfast isn’t worth it.... Milk tasted like it had been left out a bit too long. Beds were also very rickety and I woke up after my first night with a couple of bites that I can only assume were from the hostel bed. If you’re just looking for somewhere to lay your head at night then it’s great, if not reconsider. 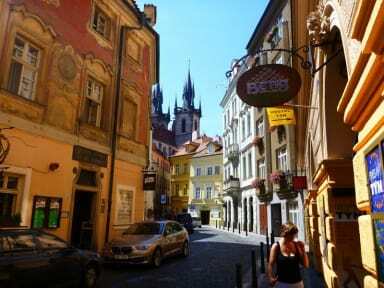 This hostel is in a great location, really close to the old town square. It also has lockers for all your valuables and free breakfast. However, the beds are extremely uncomfortable! The mattresses are foam and are so old that each one has a huge dent in it in the middle and you can feel the wooden slats beneath. It is impossible to get comfortable. The staff weren’t particularly friendly. I arrived and they have a really awful checking in system. It takes ages. Then i was told i couldn't pay by card, after waiting ages and filling out the details. So i had to go to an atm and get cash. When i came back SIX people were now waiting to check in. She told me now i had to wait BEHIND all these people, even though I'd filled out all the details. I walked out and found another place to stay. Left my deposit behind. I wouldn't recommend to anyone to stay at this hostel! I have booked a bed in a one location, but when arriving I was informed that I need to leave to another hostel of their chain due to emergency. And it was the worst hostel experience ever. Overcrowded rooms with little space. It was not possible to sleep, as there was too much noise coming from guests, that were coming back from parties at night and screaming-puking during their road to their room.